The holiday home, Villa in de Duinen, is situated at the top of your very own dune, between the sand hills; there is no other more impressive sea and beach experience. 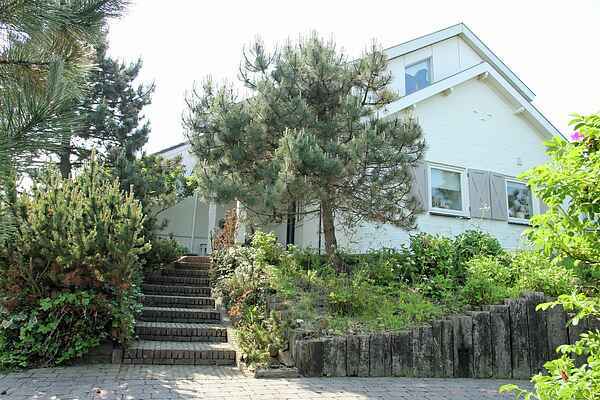 The villa offers a tremendous panoramic view over Bergen aan Zee. Within minutes, you can walk from the holiday home to the beach. Your holiday feeling starts from the moment you reach the driveway. Adjacent to the villa is an apartment which is sometimes occupied; however, it does not interfere with your privacy. When you enter the villa you notice the rustic interior right away. Earth tone colors are used throughout the house. The attached sun room offers lots of light and a view of the dune landscape. From the moment you are on the terrace, you will have the feeling of picnicking in the dunes, but with the comfort of being at a table. There are many seating areas outside, perfect to read your favorite magazine in a beach chair: no problem! With buckets and spades in hand, you just walk right onto the beach. The village of Bergen is definitely worth a visit, walking along the long lanes, while a summer breeze blows through your hair. With the car or train you can reach Alkmaar in no time, the perfect place to go strolling or shopping. A day trip to the Capital? A great idea!